After the crossing into the State of Baden-Wuerttemberg, Hemsbach will be one of the first towns on the motorway leading from Frankfurt-on-Main via Darmstadt to Heidelberg. A home to Jews since the 17th century, the town's Jewish population peaked in 1846 when 142 represented about one-tenth of all its citizenry. By 1933 there were still 54 left. Nowadays, its Jewish cemetery and former synagogue, now restored, bear testimony to their former presence. More than 300 years old, the cemetery is situated east of town in a romantic forested setting. Jews from neighbouring locales are also buried there. The erstwhile Jewish community centre, built at Mittelgasse 16 in 1845-46, is architecturally accented by Roman arches. The synagogue adjoined the building to the east; the western section included a classroom at street level, the residence of the school teacher and cantor on the floor above. A ritual bath house was situated on the south side of the synagogue's yard. Following its restoration from 1985 to 1987, the synagogue building is now used for lectures, concerts and other cultural purposes. The bath house has been converted into a memorial to the former Jewish community. South of Hemsbach, in Weinheim, the "Judengasse" (Jew Alley), dating to the Middle Ages, is one of the mementoes recalling the former Jewish community. The alley ends at the "Judenturm" (Jew Tower) that was part of the towns fortifications. The synagogue at Buergermeister-Ehret-Strasse 5, built in 1906, was destroyed in 1938. It is only a few kilometers from Weinheim to Mannheim. The city was once home to one of southern Germany's major Jewish communities. In 1925 its congregations had nearly 7,000 members. At least 1,300 of them perished during the Nazi regime. The large main synagogue at F 2.13 street and the Lemle-Klaus synagogue at F 1.11 street are commemorated by markers. Mannheim's Jewish community, revived after World War II, now has a beautiful, modern synagogue, inaugurated in September 1987, at F 3 street. The old Jewish cemetery at F 7 was forcibly cleared in 1938. The remains of its 3,585 dead were laid to rest in the cemetery on Feudenheimer Strasse. The facility, established in 1840, still serves the community. Mementoes of the city's rich Jewish heritage as well as the numerous social and cultural contributions made by its Jews are evident throughout Mannheim. Heidelberg, home of the "University for Jewish Studies" at Friedrichstrasse 9, is an important center of Jewish life in Germany today. Jewish communities existed in Heidelberg in the Middle Ages and again since the 17th century. The synagogue, built in 1878, wrecked in 1938, is commemorated by a plaque at the corner of Grosse Mantelgasse and Lauerstrasse. Graves dating to the 18th-19th century are in the old cemetery on the Klingenteichstrasse. Since 1876 Jews have been buried in the Jewish section of the city's Bergfriedhof. Unitl the early 20th century a small Jewish community existed in Leimen, south of Heidelberg. The town's former palace, built 1794-1802, bears witness to an interesting aspect of Jewish history. Owned by the Seligmann family, the court's financial adviser, this building now serves Leimen as a town hall for representation purposes. The walls of the former banquet hall still feature tapestries illustrating Jewish history. Waibstadt is about 25 kilometers southeast of Leimen. It pays to see its impressive Jewish cemetery which, founded in mid-17th century amidst a forest, was used at times by as many as 30 Jewish communites in the vicinity. The graveyard with its several thousand graves features most conspicuously in its western section the mausoleum for the family of Dr. Hermann Weil from Sinsheim. Around 1900 Weil owned one of the foremost global grain trading companies and operated out of offices in Buenos Aires and Frankfurt-on-Main. Weil was buried in the mausoleum in 1927. This unusuel structure was patterned on the Dome of the Rock in Jerusalem. From 1860 to 1938 Walldorf's synagogue was located in a former church. The building still stands on the Synagogenstrasse (Synagogue Street) at the corner of Albert-Fritz-Strasse 7. A Jewish cemetery, opened in 1880, adjoins the public cemetery directly to the west. Wiesloch, where a settlement of Jews existed in the Middle Ages and from the 17th century, has an interesting Jewish cemetery. Situated on Merianstrasse at the edge of the "Altstadt" (old town), the grave site had served the communities in Wiesloch and its environs ever since the 17th century and to some extent also into the 20th century. The Bruchsal area included Jewish communities in Bad Mingolsheim (the former synagogue building behind Friedrichstrasse 25 and the cemetery at the end of the Konrad-Kreutzer-Strasse have been preserved), Bretten (cemetery at the Windstegweg), Bauerbach, Gondelsheim (former synagogue building at Leitergasse 6), Malsch, Heidelsheim (with "Judengasse" - Jew alley dating to the 16th century), Obergrombach (a partially preserved cemetery in the forest dating from the 17th century), Oberöwisheim (17th century Jewish cemetery), Untergrombach, Unteröwisheim. In Bruchsal a plaque at Friedrichstrasse 78 recalls the synagogue, erected 1880-81 and completely destroyed in 1938. The Jewish cemetery is part of the municipal burial grounds. In Karlsruhe a Jewish community came into being shortly after the founding of the city in the 18th century. The main synagogue, demolished in 1938, stood on the property at Kronenstrasse 15. A memorial marks the site. The new synagogue and the community center, inaugurated in 1971 for the community established after World War II, are situated at Knielinger Allee 11. The cemetery on Kriegsstrasse 36 dates to the 19th century; it includes several 18th century stones from a still older burial ground on Mendelssohnplatz. This graveyard was levelled in 1898. A cemetery, still in use at Haidstrasse and Neustrasse 41-45, is directly adjacent to an earlier orthodox Jewish burial site, distinguished in particular by Hebraic inscriptions on its grave stones. The large central cemetery for Jews located in Kuppenheim, some 25 kilometers south of Karlsruhe and not far from the motorway to Basel, served congregations in the immediate vicinity and even somewhat distant areas from the 17th to the 20th centuries (Baden-Baden, Bodersweier, Bühl, Ettlingen, Gernsbach, Hörden, Kehl, Lichtenau, Malsch, Neufreistett, Muggensturm, Rastatt, Rheinbischofsheim, Stollhofen). In the 19th century some of these congregations (Baden-Baden, Bühl, Kehl, Neufreistett, Rastatt) established their own burial grounds; all habe been preserved. The Kuppenheim cemetery is located on Stadtwaldstrasse on the fringe of town. Jews lived in Baden-Baden as early as in the 16th and 18th centuries. However, the community was not organized until 1890. A synagogue, built at Stephanienstrasse 5 in the Roman revival style in 1897-98, was destroyed in 1938. A small community took root again in 1956 (synagogue Werderstrasse). Baden-Baden's Jewish cemetery is in the Lichtental district within the public burial ground on the Eckbergstrasse. In the Rhine Valley between Baden-Baden and Offenburg, Jewish congregations existed in Bühl, Lichtenau, Rheinbischofsheim, Bodersweier and Kehl. Offenburg has a relic unique to Jewish history in the Baden-Württemberg area, a ritual bath (mikve) built around the year 1300. It is reached by descending 36 steps under the house of Glaserstrasse 8. In the center of the square shaft of the bath is a circular immersion bath. The building on Lange Strasse 52 included an synagogue which had been installed in the banquet room of a former inn operating at the site during the second half of the 19th century. A marker recalls the history of the structure. In 1870 Offenburg's Jewish cemetery was located within the city's public graveyard on Moltkestrasse; it is still used. Until the Nazis came to power a good many Jewish communites existed south of Offenburg. The former synagogue in Kippenheim and a Jewish graveyard in Schmieheim recall part of the rich Jewish heritage. Built in 1850-51 the Kippenheim synagogue served the local congregation until its desecration in November 1938. Thereafter the building was principally used for storage. From 1986 to 1989 its exterior was faithfully restored to its original conditions; what remains of its beautiful former interior is being preserved. The Jewish cemetery in Schmieheim was established in the 17th century southwest of the town on the road to Wallburg. The graveyard also served Jewish communities in Altdorf, Ettenheim, Friesenheim, Kippenheim, Lahr, Nonnenweiler, Orschweier and Rust. Extensive remedial work has restored the cemetery. Relics of its building, ruined in 1938, can still be found in the graveyard. Until the 19th century Schmieheim had more than 500 Jewish inhabitants and a rabbi. He moved the rabbinate to Offenburg in 1893. The former synagogue in Schmieheim is now an apartment house. Emmendingen is located about 20 kilometers north of Freiburg. A small community was established here in 1995, consisting mainly of Jewish families from the former Soviet Union. The synagogue on Schlossplatz, ransacked in 1938 and then torn down, is now commemorated by a plaque. The two Jewish cemeteries have been preserved. The older burial ground, next to the Markgrafen school, was used in the 18th and 19th centuries. The new cemetery is directly adjacent to the municipal graveyard, the Bergfriedhof. The inviting design of the new synagogue on the corner of Nussmann- and Engelstrasse in Freiburg im Breisgau has attracted worshippers since it opened in 1987. The oak doors from the main entrance of the earlier synagogue at Werthmannplatz 1 - demolished in 1938 - have been installed in the new house of worship. In 1925 Freiburg had been home so some 1,400 Jews. More than 300 fell victim to the Nazis. In recent years the Jewish community in Freiburg has grown considerably due to the influx of families and individuals from the former Sovet Union. The Jewish cemetery on the corner of Elsässer Strasse and Rosenbaumweg, opened in 1869 and still used today, bears testimony to the importance of the old community. For many centuries there were Jewish communities in Eichstetten, Ihringen and Breisach, all in the Kaiserstuhl area west of Freiburg. Built in 1829-30 and practically obliterated in 1938, the synagogue at Altweg 10 in Eichstetten is still delineated by its perimeter walls. The Jewish burial ground, dedicated in 1809, is on Friedhofstrasse at the southern fringe of town. The synagogue in Ihringen also failed to survive. Only the rabbinate at Bachenstrasse 15 and the building at Bachenstrasse 17, once used for ritual baths, still exists. The Jewish cemetery in the vineyards - on the path to Blankenhorn - was established in 1870. Since the Middle Ages, although with some interruptions, there has been a Jewish community in Breisach. A memorial at the corner of Rheintorstrasse and "Klösterle" Street commemorates the synagogue devasted in 1938. In 2002-03 the former Jewish "Gemeindehaus" was restored as a memorial and cultural center. Two of the old Jewish cemeteries remain: the older (18-19th century) at the "Klösterle" Street behind the Synagogenplatz and the more recent (1850) located in the residential area of Isenbergstrasse/Mühlwasen. Müllheim and Sulzburg, situated about 30 kilometers southwest of Freiburg, still harbor numerous traces of Jewish history. Unfortunately the Müllheim synagogue, although spared destruction in 1938, was torn down in 1970. Except a few stones (pillars of the almemor podium, the keystone of the torah shrine) brought to the Jewish cemetery on Schwarzwaldstrasse and thus preserved, the graveyard lacks other distinctive features. Before the cemetery's dedication in 1850 the Jewish community's dead were buried in Sulzburg. The late-Baroque, semi-classical synagogue in Sulzburg, erected in 1823, was restored between 1980 and 1985 thanks to a campaign launched by preservationists in early 1964; the project was ultimately sponsored by the State of Baden-Württemberg. With the goal the restore the synagogue to its pre-1938 condition, magnificent interior paintings, particularly its starry, blue heavens on the vaulted ceiling, were recreated with loving care. The building is now dedicated to cultural endeavours. Sulzburg also has a beautifully sited Jewish cemetery dating to the 16th century. At the swiss border, opposite Basel, lies Lörrach, home to settlements of Jews from the 17th century to 1940. In 1995 the community was reborn, mostly due to the arrival of Russian Jewish families. All that remains of the former Jewish presence are two cemeteries: The one on Schützenwaldweg, which had served the community beginning in 1670, was maliciously ransacked in the 1930s. Its gravestones were mostly discarded. The newer cemetery, immediately adjacent to the municipal graveyard, was established in 1891 and is still in use. For about 500 years until their deportation in October 1940, Jews lived in the Tiengen district of Waldshut-Tiengen, a town located at the Swiss border about midway between Basel and Lake Constance. Besides several memorial plaques, only the former Jewish cemetery on what is now Feldbergstrasse recalls the town's Jewish history. The graveyard, levelled in 1938 and converted into an athletic field, was restored as a memorial after 1945. A worthwhile excursion leads from the Waldshut/Koblenz border crossing to Endingen and Lengnau in the Swiss Surb valley. Here, about 15 kilometers from Koblenz, are the sites of two significant rural Swiss-Jewish communities. In both localities excellently preserved synagogues, recently restored and still usable, bear testimony to Jewish history in the Surb valley. The large cemetery between Endingen and Lengnau is still in service, particularly as a final resting place for residents of the Israelite Old Age Home in Lengnau. Between Schaffhausen and Singen, two more Jewish communities are on the German side of the border, Randegg and Gailingen. The Jewish cemetery in Randegg, located directly at the border, is worth a visit; the key is at the customs office. Randegg's synagogue was destroyed in 1938. A commemorative stone in a small park at Otto-Dix-Strasse next to the "Krone" inn marks the site. In the annals of Jewish history in southern Germany the town of Gailingen is unique. In the 1860s it had more Jewish than Christian inhabitants (about 1,000 each) and a Jewish mayor. Leopold Guggenheim guided the fate of the entire community from 1870 to 1884. The social service facilities in Gailingen included several Israelite institution of trans-regional iomportance, in particular the Jewish hospital, built in 1891 (today, an apartment building on Büsinger Strasse 6), and the "Friedrichsheim" Senior Citizen Home which served elderly Jews until 1940. The building at Gottmadinger Strasse 1 is still an old-age home. The cemetery, enlarged several times since its dedication in 1676, became one of the largest Jewish burial grounds in Baden-Württemberg; it was reopened in 1945. The synagogue, however, fell victim to the 1938 raids. Today its site, a memorial park on Ramsener Strasse, bears memorial stones. Immediately next to it - in today's community building (Bürgerhaus) - was the Jewish school. It included apartments for the rabbi and religious instructor; the basement had a mikve. Überlingen and Constance feature significant reminders of the Jewish presence on the shores of Lake Constance. During the Middle Ages a major community was located in Überlingen where in 1332, in the course of a particularly cruel suppression of Jews, some 300 to 400 Jews were burnt to death in their synagogue. Jewish gravestones, displayed in the Städtische Heimatmuseum, the municipal museum at Krummebergstrasse 50, bear witness to this medieval community. One stone is dated 1275. In Constance the "Judenturm" (Jew Tower), built in the 13th century as part of the city's fortification, was financed by Jewish families. It reflects the importance of the town's Jewish community during the Middle Ages. The synagogue of the newly revived 19th-century community, located at Sigismundstrasse 19, was destroyed in 1938. A commercial building at the site has included a prayer room since 1964. The Jewish cemetery, consecrated in 1869, is now part of the municipal cemetery at Wollmatinger Strasse; it was enlarged in 1981 and still serves the community. Two well-known Jewish communities are situated in Upper Swabia: Bad Buchau and Laupheim. The Buchau community dates back to medieval times; in the 1850's its more than 800 Jews lived in the socalled "Judengasse" (Jew Alley) and its side streets; through the centuries their religious life centered on several prayer rooms and synagogues. Built in 1837-38 and ruined in 1938, the synagogue was deemed to be one of the most beautiful houses of Jewish worship. Today only a memorial recalls its location at the corner of Hofgartenstrasse and Schussenrieder Strasse, now site of a park with a large weeping willow. The rabbinical office was next to the synagogue at what is today Hofgartenstrasse 4. On account of severe space constraints in the 18th century, a beautifully-located cemetery, established in 1659, had to be covered twice so that the graves in the southeastern part of today's cemetery are now stacked three high. The Einsteins were one of the old-established Jewish families in Buchau. A plaque honoring Prof. Dr. Albert Einstein, the world-renowned physicist, ist to be found on his family home at Hofgartenstrasse 14. He was born nearby Ulm. The Jewish history of Laupheim community dates back to the 18th century. Around 1870 some 850 of the town's inhabitants were Jews. They lived on what is still called the "Judenberg" (Jew Mountain). It was only after 1828 that Jewish families were allowed to settle elsewhere. In 1877 two towers added to the synagogue, built in 1836 near Jewish Mountain, made the building look more like a church. It was ransacked in 1938. The cemetery on Jew Mountain, dedicated after 1730, was enlarged several times. In 1984, a marker with the names of 99 former Jewish Laupheim residents who perished during the Nazi period, was prominently mounted on the entrance to the cemetery. Carl Lämmle, one of Laupheim's best know Jews, died in Hollywood in 1939. As a young man, he emigrated to the United States in 1883, opened his first movie house in Chicago in 1906 and founded Hollywood six years later. He was named an honorary citizen of Laupheim in 1919. The house in which he was born in 1867 is located on Ratstrasse 9. Many Buchau and Laupheim Jews moved to Ulm in the second half of the 19th century when after centuries of having been banished from cities Jews were again allowed to settle there. However, Ulm had already been home to a noteworthy Jewish community in the Middle Ages as evidenced by the "Judenhof" (Jewish Court), not far from Ulm's cathedral. This area was home to Jewish families from the midle of the 14th to the close of the 15th century. One of the gravestones from the medieval Jewish cemetery is now part of the exterior of the house on Rabengasse 7. Ulm evicted its Jews in 1499. Initially, after some families returned in the early 19th century, they were still counted as belonging to the Jewish community in nearby Laupheim. Jewish services were revived in 1845. The large synagogue dedicated at Weinhof 2 in 1873 was destroyed and torn down in 1938. A Jewish cemetery, initially part of the erstwhile municipal burial ground, was established on Frauenstrasse (today it is a park; only some Jewish gravestones remain). In 1899 the Jewish community was allotted part of the municipal graveyard on Stuttgarter Strasse. It is still in service (a new Jewish community was formed in Ulm in 2002!). The house on Bahnhofstrasse 20, where the city's most famous native, the physicist Prof. Dr. Albert Einstein, was born in 1879, was destroyed during World War II. Buttenhausen near Münsingen harbored the only Jewish community in the Swabian Alb. Jews settled there in the middle of the 18th century. The synagogue was erected in 1795 in the residential area outside the center of town, on the opposite bank of the Lauter River, now known as the Mühlsteige. Enlarged in 1871, the synagogue was destroyed in 1938. Since 1966 a plaque commemorates its former existence. The Mühlsteige also leads to the Jewish cemetery, partly situated on a steep slope. Lehmann Bernheimer, one of Buttenhausen's well-known sons (he later moved to Munich) donated the Bernheimer middle school in 1901. Jews resided in Hechingen, at the foot of the Swabian Alb, almost uninterruptedly from the 15th to the 20th century. At times Jews accounted for one quarter of the city's population. It appears that they lived initially mostly on Goldschmiedstrasse, also called "Judengasse" (Jew Alley). In 1754 a separate Jewish area was developed on Friedrichstrasse, about 1 kilometer outside the city. Only 10 families were allowed to remain in town, all others had to move into the new development. By the 19th century, Jewish families were again able to reside anywhere. Between 1800 and 1850 Hechingen had three synagogues: the main synagogue on Goldschmiedstrasse 20 (restored in 1983-86), a synagogue in the Friedrichstraße settlement (torn down in 1878) and another in the Talmud school in the "Münz" (used until 1850). Jews contributed signicifantly to the rapid industrialization of the town in the 19th century; almost all textile as well as other manufacturing facilities were founded by Jewish enterpreneurs. In medieval times Jews had already settled in the charming town of Haigerloch. A more recent community dates back to the 16th century. Until 1780 Jews mainly rented dwellings in town. Thereafter the town ordered local Jews to settle in its "Haag" district. A synagogue was built at its center in 1783 and destroyed in 1938. However, the building remains (restored in 2002-03). So does the structure next door, which in former times housed the mikve, as well as a nearby building of the Jewish community center, erected in 1844, which contained classrooms and residences to the rabbi and school teacher. A Jewish cemetery had existed in the 16th century far outside Haigerloch, in a forest near Weildorf. Only a few stones still exist. Since 1804 a new cemetery has been located below the Haag residential area. It includes several commemorative markers. Several Jewish communities made their home in the upper Neckar valley region. The presence of Jews in Rottweil is documented back to the Middle Ages. What used to be the "Judengasse" (Jew Alley) is now Lorenzgasse, but no other indications of their residence are extant today. Even though Jewish families were again allowed to reside in town in 1806, the city's Jewish community remained small in the following decades. Yet a prayer hall existed in Cameralamtsgasse 6; the room, demolished in 1938, was restored under the guidance of experts by the city's youths in 1982. The cemetery on the corner of Hoferstrasse and Lindenstrasse was dedicated in 1850. 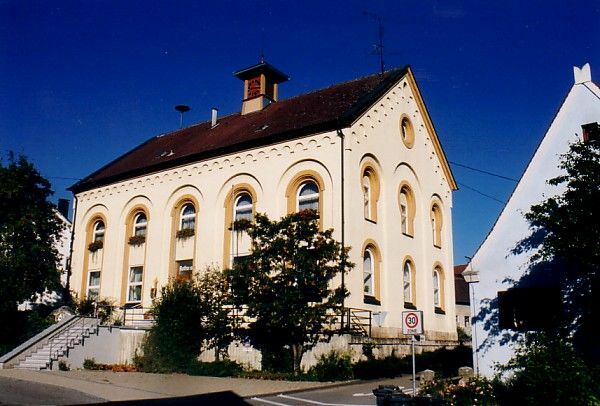 Of several Jewish communites in the region around Horb on the Neckar River, a small settlement in Dettensee existed until the beginning of the 20th century; its synagogue was dismantled after the dissolution of the community in 1928. Only the cemetery east of town evidences Dettensee's Jewish history. A small Jewish community in Mühlen am Neckar suffered a similar fate. Its Jews left before World War I. Their graveyard on Egelstaler Weg southwest of the railroad station is the only memento of their former presence. Of greater significance are the communities in Mühringen, Nordstetten and Rexingen. Mühringen, where a rabbinate was established for many decades, had more than 500 Jewish residents in 1850. The large synagogue, built in 1807-10 as an integral part of the town, escaped destruction in 1938, but was torn down in 1960. The former rabbinate building still exists; it had also housed the "Hirsch", a Jewish inn. Relicts of its ritual bath are still in the basement. The large Mühringen cemetery in a forest east of town is particularly impressive. Nordstetten's best known Jewish citizen, Berthold Auerbach (born in Nordstetten in 1812, died in Cannes, France, in 1882), ranks among Germany's most popular 19th century anthors. His family resided in Nordstetten for more than 200 years; Auerbach's house of birth on Fabrikweg 2 still stands. His grave is prominently placed in the Jewish cemetery. Nordstetten's synagogue was torn down around 1937. Rexingen had been home to a Jewish community since the 16th century. For decades its population exceeded 400 people. Unlike others, the community did not simply dissolve after 1933; it displaced to Israel wehre in 1938 emigrants from Rexingen founded Shavej Zion, a settlement north of Akko. Although the synagogue, built 1833-1937, was demolished in 1938, the building remained and has served as the Protestant community center since 1952. Its foyer displays many documents recalling the history of the town's Jewish population. The cemetery south of town, established in 1760-70, survided intact. Until the Nazi era Horb hat a Jewish community in the middle Ages, in the 17th-18th century, and yet another since the second half of the 19th century. A prayer hall, dating to the time of the last settlement, is in the building at Fürstabt-Gerber-Strasse 2. The prayer hall was destroyed in 1938, but the building still stands. The small cemetery on Mühlener Strasse, one kilometer outside town, opened in 1904. From the 16th century until the time of the Nazis numerous Jewish families resided in Baisingen, northeast of Horb. A synagogue was built in the socalled "Judengässle" (small Jewish alley) in 1782, wrecked in 1938 and used for storage after 1945. The building was restored as a museum and memorial in 1996-98. The "Judengasse" (Jewish Alley) in Tübingen's old town attests to the existence of a Jewish community in the Middle Ages. The Jewish community, revived in the 19th century, erected a synagogue at Gartenstrasse 33 in 1882. It was raided in 1938. The community's dead were buried near Wankheim (a district of Kusterdingen) in a cemetery built for the Jewish community that lived in Wankheim in the 18th and 19th century. After Tübingen dedicated its own synagogue in 1882, the Wankheim house of worship was torn down. 30 kilometers east of Stuttgart lies Göppingen and its Jebenhausen district whose Jewish community was dissolved during the 19th century when most families moved to the nearby city. In the 19th century nearly every second Jebenhausen resident was Jewish. Today their significance is reflected not only in the cemetery, but also in the Jewish museum, located in Jebenhausen's old Protestant church. It showcases memorabilia of Jebenhausen's and Göppingen's Jewish history. When the former synagogue was taken down in 1905, some of its interior furnishings were donated to the Protestant church. Göppingen's Jewish enterpreneurs were instrumental in the industrialization of the city during the second half of the 19th century. A memorial on Freihofstrasse recalls the former site of the synagogue, destroyed in 1938. Since 1904 the municipal cemetery on Hohenstaufenstrasse has also included a Jewish section. In the Middle Ages many Jews resided in Esslingen; however there are no architectural traces of their presence. A new Jewish community, established in 1806, built a central facility, including a synagogue, school and teachers's apartment on Im Heppächer 13 in 1819. The building, although damaged in 1938, still stands. The old Jewish cemetery, in use from 1807 to 1874, is on the corner of Mittlere Beutau and Turmstrasse; the new cemetery is part of the public Ebershalden burial grounds. Esslingen's Israelite orphanage "Wilhelmspflege", operated until 1939 in the building of Mülbergerstrasse 146 (today Theodor Rothschild house), is especially noteworthy. Jews also lived in Stuttgart and Bad Cannstatt as early as the Middle Ages. What is now Stuttgart's Brennerstrasse was called the "Judengase" (Jew Alley) in medieval times. Jewish communities became re-established in both cities in the 19th century; with a population of nearly 5,000 around 1931, Stuttgart developed quickly into Württemberg's largest Jewish settlement. Bad Cannstatt had almost 500 Jewish residents at the turn of the century (1900). There are four Jewish cemeteries: part of the Hoppenlau cemetery (in use between 1834 and 1873), part of the Prag cemetery (since 1873 and still in service), a section of the Steinhaldenfeld cemetery (now Zentralfriedhof, used since 1944) and a segment of the Steig cemetery in Bad Cannstatt (Jewish cemetery of the Cannstatt community since 1872-73). None of the synagogues, all built in the 19th century, escaped the destruction in 1938. The current Stuttgart synagogue at Hospitalstrasse 36, erected in 1952 on the site of the former Synagogue, is adjacent to the Jewish community center of the "Israelite Religous Community in Württemberg". It has 2,600 members (as of 2003). The city is studded with reminders of the former Jewish community and its prominent members; among others, the memorial to Otto Hirsch on the Otto-Hirsch-bridges above Stuttgart's harbour. The Jewish section of the Prag cemetery contains a monument to the 2,498 Jewish citizens of Württemberg murdered between 1933 and 1945. During the Middle Ages a Jewish community existed in Weil der Stadt, located west of Stuttgart. The "Judengasse" (Jew Alley), now the Zwingergasse, was the community's residential area. Jakob ben Yehuda Weil, a leading Jewish scholar, who was born in Weil der Stadt in 1380 and died in Erfurt in 1456, won recognition for the town. Several Jewish settlement were located in the Ludwigsburg area. The communities in Aldingen and Hochberg ceased to exist around 1900 when its constituents migrated to the cities. Nevertheless, the synagogue building in Hochberg has been wellkept because it has been a Methodist church since 1914. The cemetery on on a hill above the Neckar River has also been preserved. The burial ground served Jews from Aldingen and, for a while during the 19th century, also those from Stuttgart, Cannstatt and Ludwigsburg. Freudental, northwest of Ludwigsburg, was a center of Jewish life for a large region in the 18th-19th century. Strombergstrasse, once the "Judengasse" (Jew Alley), was the principal Jewish residential area. A number of buildings recalls its Jewish history. There is the "Judenschlössle", the socalled small Jewish castle and, adjacent to it, the beautiful synagogue, built in 1770-71, demolished in 1938, but restored in 1983-85. Together with the adjacent structures, some newly constructed, the building serves as a pedagogical-cultural center which sponsors appearances and shows by lectures and artist of all faiths. The Jewish graveyard lies northwest of town at the edge of woods. Ludwigsburg is at the center of the aforementioned rural communities. The city attracted many families in the 19th century. Their synagogue at the corner of Alleenstrasse and Solitudestrasse was inaugurated in 1884, wrecked and torn down in 1938. The property has been converted into a memorial. Two Jewish cemeteries have been preserved. Each borders on municipal burial grounds. The older of the two is on Meiereistrasse and the newer, in use since 1904, on the Harteneckstrasse. There were numerous Jewish communities around Heilbronn in the "Unterland" (low country) of Württemberg, particularly in Horkheim, Sontheim and Talheim, all south of the city. At the end of the 17th century Horkheim took in a number of Jewish families. Their apartments, houses and a synagogue were established in the former water castle. Sontheim is believed to have harbored its first Jewish settlement in the 13th century, and later another in the 17th century. The former synagogue was dismantled in 1985. A Jewish cemetery southwest of town was built in cooperation with the Talheim and Horkheim communities in 1840-41. Important to all Jews in Württemberg was the Jewish "Wilhelmsruhe" old-age home in Sontheim. Erected in 1907, it was still caring for 160 Jewish seniors in 1939-40. The facility is a clinic today. In the 18th and 19th centuries Jewish families in Talheim made their homes primarily in buildings once part of a fortified castle. A synagogue was built in the courtyard. Destroyed in 1938, it is now recalled by a memorial plaque. Affaltrach, Eschenau and Lehrensteinsfeld are especially noteworthy among the Jewish communities east of Heilbronn. The first Jews in Affaltrach came in the 17th century. By mid-19th century the community had grown to about 200 people. Because of its proximity to Eschenau, Affaltrach did not always have a synagogue. At time Affaltrach Jews worshipped at the Eschenau synagogue - and vice versa. The new synagogue built in Affaltrach at Untere Gasse 6 in 1850-51 included a Jewish school, the teachers's residence and mikve. The building, ransacked in 1938, became a warehouse and apartment building after 1945. The structure, rehabilitated from 1986-1988 is now used for cultural events and as a center for documenting the history of Jewis in the county and city of Heilbronn. From the 17th century to 1943 some 500 Jewish dead from town and its environs were buried in the community's cemetery outside Affaltrach. In the 17th century Jews also lived in Eschenau. By 1904 their settlement had shrunk to the extent that the synagogue on Treuchtlinger Strasse 9 was sold and converted into an apartment house. In 1941-42 the Eschenau castle was a waystation for many older Jews being deported from Stuttgart and other cities. Jews resided in the Lehren district of Lehrensteinsfeld from the 16th century to 1941. The regional rabbi lived in town. His rabbinate later moved to Heilbronn. Jews largely occupied the "Judengasse" (Jew Alley). Their dead were buried in Affaltrach. Jewish communities existed in Öhringen during the Middle Ages and since the second half of the 19th century. The structure in Untere Torstrasse 23, where religious services were held from 1888 until the building was ransacked in 1938, still stands. A Jewish cemetery was opened on the street "Im Schönblick" in 1911. Neckarsulm, north of Heilbronn, is believed to have been home to a Jewish community in the 13th century. Largely due to the severe damage sustained by the city in 1945, all traces of its Jewish history have been obliterated. The former "Judengasse" (Jew Alley) no longer exists. The erstwhile synagogue, in use until 1850, also fell victim to the ravages of war in 1945. What remains is the space occupied by the Jewish cemetery, located at the Waldenberg, adjacent to today's municipal burial ground. The cemetery was completely destroyed in 1938; its grave markers were mostly used as paving stones. Mounds of shattered fragments can still be found in the graveyard. There were several Jewish communities in Bad Wimpfen and Bad Rappenau. Small Jewish cemeteries are preserved in Bad Wimpfen, Bad Rappenau, Kochendorf (Bad Friedrichshall) and Oedheim. The inscription on the building of Schwibbogengasse 5 in Bad Wimpfen displays the name of its Jewish owner in 1580. In later decades this house also accomodated a prayer room, a ritual bath and the Jewish school. One of the most beautiful Jewish cemeteries in southern Germany, is near Heinsheim, part of Bad Rappenau. Since the 16th century the facility had been the central graveyard for numerous neighbouring Jewish communities. Some of its more than 1,000 headstones are exceptionally well designed. The building containing the former synagogue, built in Heinsheim in 1796, still stands at Schlossgasse 3/1. Several Jewish communities were established around Eppingen and Sinsheim, west of Heilbronn. Although the structure of Küfergasse 2, home of the former synagogue in Eppingen, now serves as a residence, its cellar still contains a ritual bath constructed in the 16th century. The buildings exterior is decorated with the most beautiful wedding "Chuppa" stone in southern Germany. The synagogue, erected in 1872-73 on Kaiserstrasse 6 at the corner of Ludwig-Zorn-Strasse, was destroyed in 1938. An abundance of extremely interesting symbolism is to be found in the Jewish cemetery, built in 1818-19 at the end of what in now the Weinbrennerstrasse. The city of Sinsheim is surrounded by several small villages, many of them home to Jews as well into the 20th century. Sinsheim had Jewish communities in its midst in the Middle Ages and again since the 18th century. The synagogue, built in 1836-37, at Kleine Grabengasse 6 was destroyed in 1938 and dismantled. A Jewish graveyard was established at the site of the current municipal cemetery. Jewish communities in the vicinity were located in Dühren, Ehrstädt, Eschelbach, Hilsbach, Hoffenheim, Rohrbach, Steinsfurt and Weiler. Of special interest: the preserved synagogue edifice, a small structure built at Adersbacher Strasse 12 in Steinsfurt in 1893, as well as the large village synagogue, inaugurated in 1832, but closed in 1907, in Rohrbach. Mosbach is reached by travelling some 40 kilometers north from Heilbronn through the Neckar valley. In medieval times and since the first half of the 18th century until 1938, this city, too, harbored Jewish communities. Around 1860 a synagogue rose in the Frohnbrunnengasse. Completely destroyed in 1938, its site is marked by a memorial. The first records of the Jewish cemetery in Mosbach date to 1559. The graveyard is located between today's municipal cemetery and the Kapellenweg. A number of communities in the Ries area of eastern Württemberg gained some importance. They trace their beginning to the 16th century following the expulsion of the Jewish population from Nördlingen. Oberdorf was the central community in eatern Württemberg. In the mid-19th century more than 500 Jews lived in the city. From 1828 to 1930 its rabbis made their home at Kirchweg 1. A large synagogue, erected in 1812 as a successor to a number of others, was damaged in 1938. After 1945 it was first a church, then a warehouse und ultimately, following its restoration, a memorial and cultural center sponsoring avariety of events. Oberdorf's Jewish cemetery on Karksteinstrasse was established in 1825. Until then the community's dead were buried in the neighbouring Aufhausen. Its community, which also dates to the 16th century, flourished in mid-19th century, but by early 20th century most of its constituents had migrated to urban areas or other countries. The synagogue, constructed in 1825, closed in 1931 and was subsequently partially dismantled. The former synagogue's foundation at Lauchheimer Strasse 21 now supports a residence with stables. The location of the community's 16th-century burial ground behind Aufhausen's public cemetery on the Schenkensteinstrasse is considered one of the most beautifully situated Jewish graveyards in Baden-Württemberg. It also served Jewish settlements in surrounding towns. The history of Pflaumloch, situated not far from the Bavarian border, indicates that Jews lived in town in 1487. They may have settled there after their expulsion from Nördlingen. The regional community erected a splendid synagogue in 1844-46. It served as a house of worship for merely a few decades because most of the congregation migrated. In 1907 local Jews donated the synagogue building to the village. It became the village hall in 1963. The Jewish cemetery in Pflaumloch, close to the public burial ground, exists only since 1833. Until then the local community buried its dead in Wallerstein, Bayaria. Lauchheim, between Aalen and Bopfingen, attracted a Jewish community in the 17th century. The synagogue, built in 1768-70, renovated and enlarged in 1856-59, damaged by arsonists in 1938, was torn town in 1965. In 1469 and 1501 Schwäbisch Gmünd expelled the Jews whose forebears had settled in the city in medieval times. A new community was founded until 1890. It maintained a special relationship with the rabbi of Oberdorf. He also tended to the needs of Schwäbisch Gmünd's community. Its dead continued to be buried in Oberdorf. A synagogue was opened in a former factory on Katharinenstrasse 5 in 1925. Vandalized in 1936, it was torn down after 1950. In the Hohenlohe region, particularly in the valley of the Jagst River, there were Jewish communities in Ailringen, Berlichingen, Bieringen, Dörzbach, Hohebach, Hollenbach, Krautheim, Mulfingen and Olnhausen. In the area immediately to the north, part of the former Baden, Jewish communites resided mainly in Billigheim, Sennfeld, Adelsheim, Rosenberg, and Hüngheim. Former synagogue edifices are still to be fount at Rathausstrasse 5 (now a residence) in Hohebach, at Hauptstrasse 43 in Sennfeld (now "Vereinshaus" and museum) and at the Buchenweg 15 in Merchingen (now a Catholic church). The Jewish cemeteries in Berlichingen and Merchingen are worth visiting. For centuries they served also Jewish populations in the vicinity. In the Middle Ages Schwäbisch Hall included a Jewish community from the 13th to the 15th century and then another in the mid-19th century. 263 Jews lived in the city in 1880. The city's Haalstrasse was the center of a Jewish residential area in the Middle Ages. Some Jews expelled from Hall are likely to have settled in the vicinity. The Schwäbisch Hall district, now identified as Unterlimpurg, had Jewish residents already in 1541. In the first half of the 18th century Elieser Sussmann, a Jewish painter from Poland, decorated the congregation's prayer room. It has been installed in the Hällisch-Fränkisches Museum in Schwäbisch Hall. Another Jewish community was in the Schwäbisch Hall suburb of Steinbach. Its Neustetter Strasse used to be recalled the Judengasse" (Jew Alley). Along the street that leads to Unterlimpurg, specifically at Neustetter Strasse 34, a synagogue was built in 1809. It remained a house of worship in Schwäbisch Hall and Steinbach until its destruction in 1938. In 1809 a Jewish cemetery was opened on Steinbacher Strasse in the direction of Schwäbisch Hall. It was vandelized in 1938 and in the years thereafter. Only some of its gravestones have been resurrected. Since 1947 several memorials of the victims of the Hessental concentration camp and Schwäbisch Hall Jews where perished. It was not until the mid-19th century that Jews were allowed to reside again in Schwäbisch Hall. A prayer room, opened in the house at the Obere Herrengasse 8, was until wrecked in 1938. The rabbinate which was moved from Braunsbach to Hall around 1900 was in the building at Obere Herrengasse 1. Jewish communities existed near Schwäbisch Hall in Braunsbach, Michelbach an der Lücke and Hengstfeld. Documents show four Jewish families to have lived in Braunsbach in 1673. They resided below the Braunsbach castle ("the Judengasse" - Jew Alley - now called Obere and Untere Pfalzgasse). A synagogue, built in 1732, served as a house of worship for the community until its interior was destroyed in 1938. In 1984 the building was incorporated in the newly-constructed "Burgenland-Halle". Braunsbach's rabbinate, established in 1832, was moved to Schwäbisch Hall around 1900. The Jewish community in Michelbach an der Lücke dates to the 16th century. Most of its residences as well as the synagogue, erected in 1756-57 and renovated in 1844, were located on what is still called the "Judengasse" (Jew Alley). The synagogue was not destroyed in 1938, but its interior appointements were lost when the building was put to other uses. Restored in 1983-84 the structure now serves as a memorial and museum dedicated to the Jews who once lived in Franconia. The Michelbach community initially buried its dead in Schopfloch, Bavaria, but, after 1840, in its own burial ground, still preserved northwest of the village. Neighbouring Hengstfeld lacks any special elements reminiscent of the Jewish presence except for former Jewish residences. The synagogue was closed around 1895 and ultimately dismantled after most Jewish inhabitants had left. With some interruptions Jews lived in Crailsheim since the Middle Ages. The local synagogue, erected in 1783 at Adam-Weiss-Strasse 5, demolished in 1938, sustained added damage at the end of the War in 1945. The Jewish cemetery, established in 1841 at the Beuerlbacher Strasse, contains a memorial plaque dedicated to local Jewish soldiers who gave their lives fighting for Germany in World War I and another with the names of residents who died as victims of the Nazis. In addition to the Jewish community in Bad Mergentheim, there wer others in the city's environs at Edelfingen, Markelsheim, Neunkirchen and Wachbach; to the east and southeast also in Igersheim, Weikersheim, Creglingen, Archshofen and Niederstetten. Of special interest in these localities are the old Jewish burial grounds in Unterbalbach (which served both Bad Mergentheim and surrounding communities), Weikersheim, Creglingen and Niederstetten. Remains of former synagogues have been preserved in Markelsheim (Kirchgängle 7, now a residence), Weikersheim (Wilhelmstrasse 16), Creglingen (Neue Strasse 28, now a restaurant), Archshofen (building Nr. 40 on the Tauber River, now a community building). In Tauberbischofsheim and its outlying districts Jewish communities were established in Dittigheim, Hochhausen and Impfingen. Presumably Jews resided in Tauberbischofsheim from the 13th to the 20th century almost without interruptions. The synagogue from 1730-40, located at Bachstrasse 9, was converted into a residence after 1945. Since 1875 the Jewish graveyard has been situated adjacent to the municipal cemetery on Hochhäuser Strasse. A beautiful wedding stone is mounted on the former synagogue building in the Synagogengasse in Dittigheim. Wenkheim, north of Tauberbischofsheim, had a Jewish community from the 16th to the 20th century. A major Jewish graveyard, in the woods east of the town on the border to Bayaria, has been preserved. It was used by communities in the vicinity. Although the former synagogue in town was devasted in 1938, the building still stands and was designated upon its restoration in 1988 a memorial and cultural center after having served residential and storage purposes for many years. The Jewish communities in the cities of Walldürn and Buchen were surrounded by others in Hardheim, Hainstadt, Bödigheim and Eberstadt. The Jewish cemetery in Bödigheim is considered noteworthy because it may have served at times as many as 30 neighbouring communities since the Middle Ages. For centuries the communities, located half way along the length of the Main River, had made Wertheim a focal point. That the local Jewish population had already made its mark in the Middle Ages is reflected by Jewish families named Wertheim(er) residing around the globe. History cites a Jewish presence in the town in the year 1212. In the Middle Ages they lived in the Kapellengasse, then the "Judengasse" (Jew Alley), where the synagogue (it was already the second structure) was located. In 1447 Christian inhabitants destroyed the building and put a Marienkapelle (Mary's chapel) in its place. The medieval inscription on the chapel recalls to this day the destruction of the former "Judenschule". The synagogue, erected in 1798-99, was destroyed in 1938 and dismantled in 1961. A cemetery had already been established in the Middle Ages (12th-13th century, early 15th at the latest). Used until the 20th century, it is the oldest remaining Jewish burial site in the State of Baden-Württemberg. 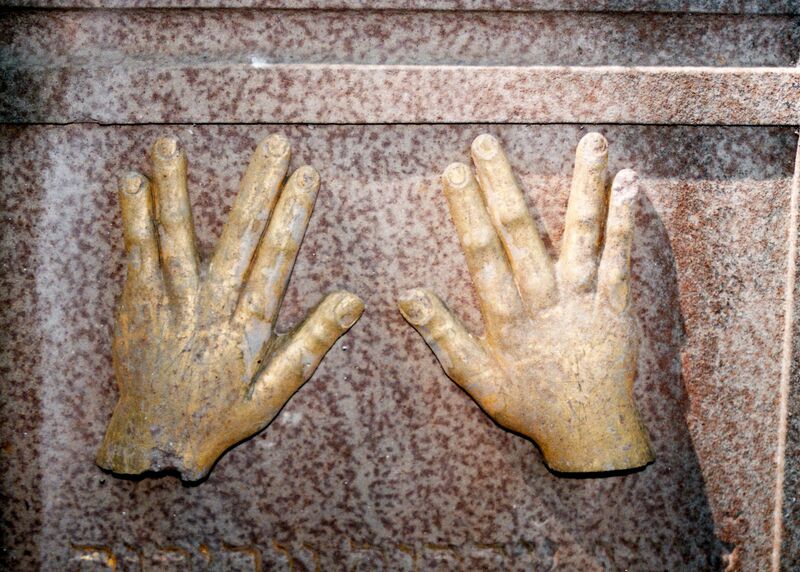 Numerous tombstones from the 15th century have been preserved. Some reach further into history than the oldest stones of the well-known Jewish cemetery in Prague. Külsheim, south of Wertheim, is also the site of an old cemetery. It is presumed to have existed since the Middle Ages. From the 17th to the 19th century it was the central burial place for several Jewish communities, including those in Gissigheim, Königheim, Tauberbischofsheim, Hochhausen and Hardheim. The Külsheim synagogue, built in 1770, burned to the ground in 1944.